May your Christmas be a holy one that is filled with God’s blessings. You, those you love and all of your intentions will be remembered in our prayers Christmas Day, as they are every day. We honor you and we thank you for your kindness to the thousands of far-flung and isolated village people whom we serve. May Our Almighty Father bless you abundantly. TAKE A BOUGH: (left) Volunteer music director Laura Davis eyes a prospective Christmas “tree” for the KNOM studio’s front office. Nome is tree-less, and it’s expensive to air freight a fir tree. And so, we decorate as old-time Nomeites do, trimming a willow shrub. Willows can be found almost everywhere on the tundra. GIVE KNOM FOR CHRISTMAS: You can send a donation to KNOM in honor of family or friends. We will send those you honor a beautiful Christmas card to acknowledge your generous gift. Just send us their names and addresses and we will do the rest. You can wish your loved ones a joyous KNOM Christmas. KEEPING TRIM: The week after Thanksgiving, the KNOM signal sparkles with Christmas songs and hymns, stories and prayers. It’s the radio equivalent of trimming a Christmas tree as we emphasize Whose birth we honor this time of year. It’s in addition to our continuing national, regional and local news, interview and call-in programs discussing issues vital to people of western Alaska, the Mass and the Rosary, as well as positive entertainment, special features and the 2,800 educational spots and 2,800 inspirational spots we broadcast each month. If you wish, you can contribute here. Thank you for helping us sustain the oldest Catholic radio station in the United States. CHRISTMAS INSPIRATIONAL SPOT: Along with every Christmas card and every Christmas present, Lord, I will send a special prayer. I will ask that You may be at the very center of their Christmas. And my prayer will get there first! 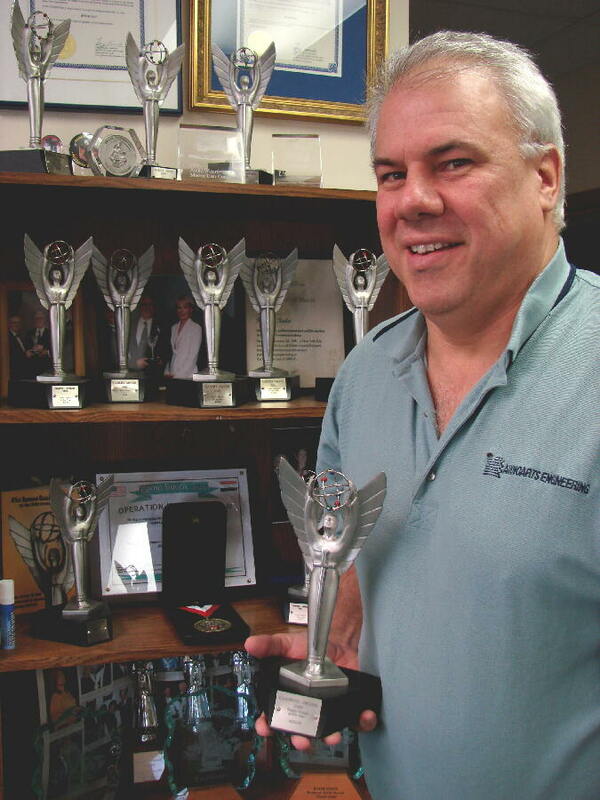 ANGELS: (left) In Los Angeles in October, general manager Ric Schmidt accepted KNOM’s 2007 Gabriel “Radio Station of the Year” Award. In the KNOM front office, you can see some of the mission’s previous 15 Gabriels behind him. They are among broadcasting’s highest honors. Ric honored contributors, listeners and staff, and noted that the list of people to thank, including you, would be miles long. Best Radio Entertainment Program, for Dave Dodman’s 2006 Christmas play “Coldest Heart"
“Coldest Heart,” incidentally, was written by 2000-2002 KNOM volunteer Andrew McDonnell, who now lives in South Bend, Indiana, but continues to write interesting and entertaining shows. Andrew-written Christmas plays have won five ABA “Best Entertainment” Awards. FOCUS ON EDUCATION: Partnering with the Bering Strait School District, KNOM news director Paul Korchin has created “Berings,” an 8- to 14-minute program featuring students, teachers and administrators of individual village schools. In these programs, the young and old folks talk about the accomplishments they’ve made and how they made them. The idea is to share success stories and raise educational standards throughout this vast region. So far, the show has been immensely popular. TO ERR IS HUMAN: Due to a mixup by the company which mails this newsletter, the September and October editions were mailed within a week of each other. We’ve taken steps to prevent this from happening again, and we apologize to you for the error. WILLFULLY: Many of our friends, including present and former staff, remember the KNOM mission in their wills. All bequests go into funds that protect the mission against future emergencies and provide for major improvements. CHRISTMAS INSPIRATIONAL SPOT: In Mary’s life we find a blend of surrender to God, integrity and inner strength. Surrendering to God is not a passive or weak stance. One must possess strength of both faith and character to say “may it be done to me according to Your Word,” as Mary did at the Annunciation. What parts of our lives need strength to surrender to God? CHRISTMAS INSPIRATIONAL SPOT: What the Gospels depict in the Christmas story is not the revelation of a mighty, powerful king. What is shown is an infant, a weak and helpless infant in His mother’s arms. Christians look at this baby and believe that He is the Son of God, the very image of God’s splendor, and recognize Him as the Lord of history. God’s wisdom contradicts the wisdom of the world. 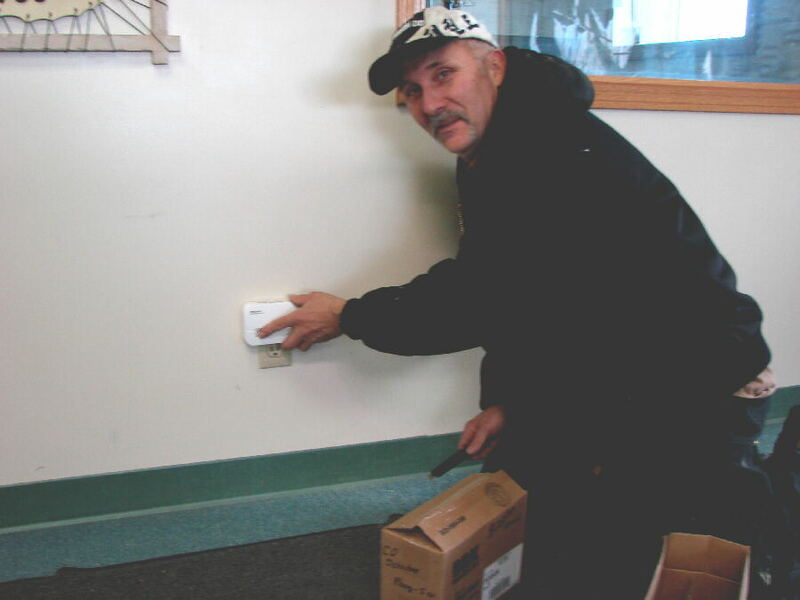 WHAT A GAS: (left) Nome Jack-of-all-trades Dan Scholten installs a carbon monoxide detector in the KNOM front office, one of several in the studio building and volunteer house. Dan had suggested these added protections for the staff as part of a fix-me-up, the first major repairs for the 15- and 16-year-old mission buildings. FRONT ROW SEAT: For some of KNOM’s listeners, a trip to Fairbanks involves the same distance as one from Boston to Atlanta, and can cost as much as $1,000. For some, such as the residents of remote Little Diomede Island, travel at this time of year is impossible. Thanks to KNOM, however, thousands of village families had front row seats at the Alaska Federation of Natives convention, as we broadcast the proceedings live. 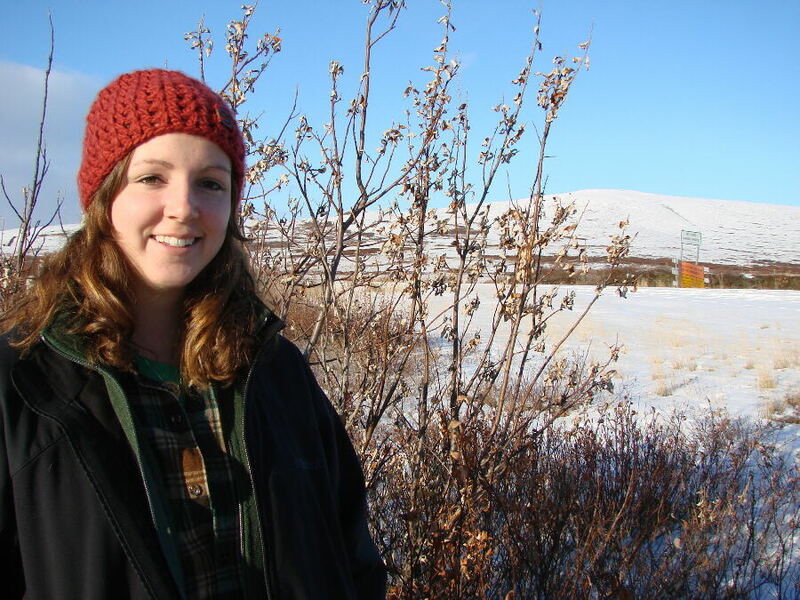 KNOM public affairs director Amy Flaherty was in Fairbanks to cover local angles and speak with regional Native leaders, in the course of the event producing 21 special reports for our listeners. Thank you for helping to make this unique and important programming possible. STOCK ANSWER: We gratefully accept gifts of stock and other securities. All such gifts are applied toward future major improvements. Please specify that the gift is for the benefit of KNOM and inform general manager Ric Schmidt of the gift. POSTAL WOES: The small Nome post office is four staff short this month. If it takes us longer than usual to reply to you right now, it’s because your mail is reaching us in fits and starts. CHRISTMAS INSPIRATIONAL SPOT: Almighty God and Father of Light, a Child is born for us, Your Son is given to us. Open our hearts to receive His Life and increase our vision with the rising dawn, that our lives may be filled by His glory and with His peace forever and ever. Amen. HIGH NOON (left): If you visit the KNOM transmitter site on the shortest day of the year, this is what you’ll see at high noon. In the background, you’ll find the mouth of the Nome River, and the Bering Sea beyond. The sun’s up for less than four hours. We find it interesting that this powerful voice that provides spiritual guidance, companionship and comfort to so many people is located at such a lonely site. It’s also curious that this beacon of health and safety is located at a spot that due to weather — and bears — frequently can be life-threatening. FORTY YEARS AGO: In Nome, December 1967 begins with –25� weather, common for this time of year. 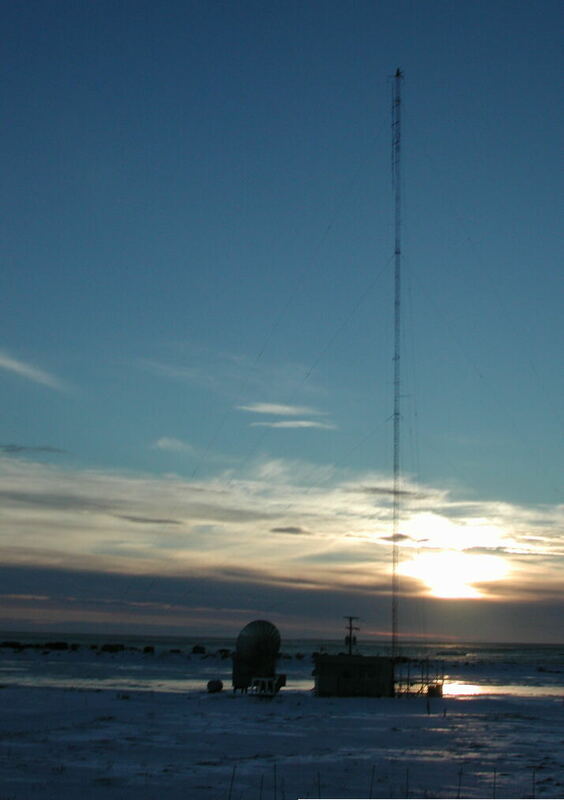 The mission begins looking for professional broadcasters who are willing to take time out from their paid careers to get the proposed Nome radio station going. THIRTY YEARS AGO: It’s KNOM’s seventh Christmas on the air. Volunteer announcer Chris Robling is Santa Claus for Brownie Troop 93, which is led by KNOM volunteer cook Colleen Harrington. In December 1977, the station is producing sixteen new educational and inspirational spots a week. WE RESPECT YOU: We repeat to you a pledge we have made for more than forty years: We will never provide your name and address to anyone, for any reason. YOU ARE OUR STRENGTH: It is your prayers and your financial contributions that keep our powerful radio station beaming encouragement, education and inspiration throughout this vast region. Thank you again, so very much. Once more, may your Christmas be a blessed one!